Can anyone catch Brooks Koepka for Player of the Year honours? Voting for Player of the Year will commence on the PGA Tour shortly after the Tour Championship. Is there anyone that merits consideration for the award in the face of Brooks Koepka’s two major victories? 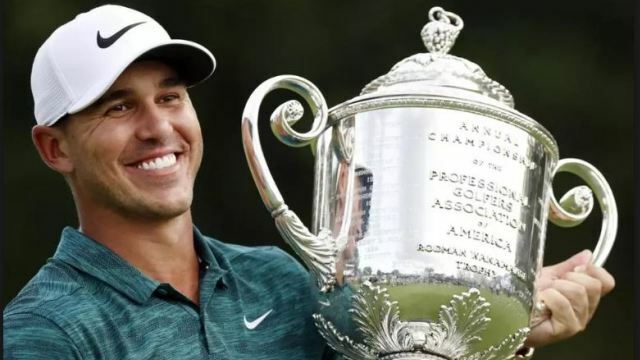 Jim Deeks, Fairways Magazine (@jimdeeks): Even though Koepka is still not a household name, and keeps a pretty low profile, it’d be a travesty if he weren’t voted Player of the Year. Tiger certainly deserves Comeback of the Year, and Dustin Johnston has been on just about every leaderboard (except maybe Paulina’s); but you can’t ignore two majors. Michael Schurman, Master Professional / Life Member, PGA of Canada: FYI – there are two awards: the PGA Player of the Year and the PGA TOUR player of the year. The first is won via points or a scoring system, which seems a little more real. The second is given based on a vote of the PGA TOUR players. It’s difficult to shrug off what your peers think but it is still a popularity contest. Snead won eleven times in 1950 and Ben Hogan who won twice with one being the US Open was the PGA Player of the Year. Mark O’Mara earned his recognition in 1998 when he won twice but both were majors. Since there are three players who won three times, but none are majors, Brooks is the ‘hands down’ winner. Dave Kaplan, Freelance Writer (@davykap): You could make a case for Bryson DeChambeau and his three wins this year, but it would not be a very strong case. Two majors trumps three regular season/playoff wins every time. Plus, the Human Bulldozer successfully defended his US Open title. That is just incredible, regardless of which era you are playing in! Koepka deserves this award. TJ Rule, Golf Away Tours (@GolfAwayTJ): Well, it’s impossible to not give the award to anyone that wins two majors and has a decent rest of the year, which is the case with Koepka. There are others that had decent years, including 4 guys who had more victories than Koepka, but none of them won a major! If you put stock in Majors, then perhaps Molinari deserves a look due to his smoking hot July where he won in Texas and at Carnoustie. But I think the only guy who has a chance is DeChambeau, if he happens to complete the playoff hat-trick and win at East Lake. Peter Mumford, Fairways Magazine (@FairwaysMag): It’s pretty hard to top one major in a season, let alone two. The best players in the game have made the benchmark for success in a season or a career about major victories in such a way that the rest of the tournaments are just warm-up acts for the real thing. Francisco Molinari deserves consideration for his three wins this year that included a major (Open Championship) and one of the majors on the European Tour (BMW PGA Championship) plus a win on the PGA Tour. That’s a great year by anyone’s standards but it still falls short of Koepka’s two majors. A recent article by John Hawkins (HERE) says that winning ought to mean more. In the seemingly endless schedule of the PGA Tour, where one event is often undistinguishable from another, do you find that there is too much emphasis on money won, FedEx Cup points races and stats and not enough attention paid to winners? Deeks: Well, what attention is John Hawkins suggesting is missing? I mean, in the scheme of things, should anybody care that Player X won the John Deere Classic or, for that matter, the Canadian Open? Other than giving them an obscene amount of money, and exemptions and other perks, what else are we supposed to do? Win a few times on Tour, okay, THEN you get more respect and name recognition, as it should be. But I’m just fine with the amount of attention, and $1.2million, that Gary Woodland got for winning the Waste Management Open, thank you. Schurman: I don’t mind seeing the best players in the world compensated for their performance. IMO the best at anything should be able to capitalize on their skills. Unfortunately, the market always determines how much those skills are worth. For years players in other sports earned many times more than golfers and had no expense to their earnings. When you consider travel, accommodations, tournament fees etc. the top players spend hundreds of thousands of dollars to earn what they earn. As far as recognition goes I think there is a very good balance between the money and the fame. Kaplan: I can’t say that I agree. The problem is that there are way too many tournaments these days—one each week, in fact—and that winning a single event in an oversaturated schedule does not carry the same weight as used it to. Not that it has ever happened…but in theory, we could see something like 50+ different winners in a single season. Aside from the four majors, nothing would make any of these wins stand out from one another. Yearly earnings, FedEx Cup points and Ryder Cup rankings help fans determine the small number of players, among these winners, that have had standout seasons. Rule: Ultimately winning means everything in sport. But golf is a bit different because guys are playing for their jobs, and if they don’t grind for that extra stroke or two to get inside the top 20 to pick up FedEx Cup points, they may not have a place to play the following season. So, it’s important to have the money list, FedEx Cup points race, etc. I think that winners get their just due, I don’t remember many guys who finish second in tournaments, but I can name most of the major champions in the past 10 years! Mumford: The problem isn’t that winners don’t get enough attention – it’s that there are too many of them to remember. As we’ve discussed before on the Round Table, there are 8-10 events each year that really matter and the rest get lost in the shuffle. I’d be delighted if the PGA Tour cut down to 25-30 events, rewarded the winners with a bigger share of the purse and made more events open to winners only, not non-winners that have amassed points or dollars for lots of top 20 finishes. Professional sports is all about winning and losing and it’s time that the PGA Tour made that more of a focus and stopped celebrating guys like Charles Howell, who have made a very lucrative career out of not winning. The new Rules of Golf, which will come into effect on January 1st, 2019 were released to the public last week. In his latest blog (which you can read HERE), Jim Deeks has already noted two rules he thinks they missed. What’s your take on the simplified Rules and are there some you think they missed or didn’t go far enough in changing? Schurman: Golf is the only professional sport where the average person can place his/her feet exactly where Tiger stood and play the shot that Tiger played. People want to play the same rules as the ‘big boys and girls’. When you consider the Original 13 rules written by the Honourable Company of Edinburgh Golfers served for nearly 150 years (with a variety of interpretations) it shouldn’t be THAT difficult. The game played by the masses resembles golf in most ways, but the leniency tolerated between cooperating groups is part of the charm of the game. Rules for competition and then who really cares! Kaplan: I love the new Rules of Golf and I think it is a great first stab at modernizing this game for the next generation. Of course, this is only the first round of rule changes. We will likely see several more iterations down the line. I agree with both of Deeks points, especially that it’s time to do away with the 14-club rule, which just seems so arbitrary. You should be able to carry as many clubs as you want. It really makes no difference because, as Jim points out in his excellent column, you still need to execute your shots and are just as likely to botch pressure shots with a 15th or 16th club as you would with any of the 14 already in your bag. I hope that in the next instalment of rule changes, the governing bodies decide to do away with archaic dress codes. It’s been like 10,000 degrees outside this entire summer and yet, I still cannot wear a tank top on the golf course. Somehow, female golfers can, though!? That is a crappy double standard, if I’ve ever seen one. I’m tired or risking heat stroke out there because of the possibility of my bare shoulders (gasp!) offending someone’s crustaceous sensibilities. Let’s get with the times! Mumford: A huge move forward but still too many Rules and still more complex than they need to be. I’m a big fan of “hit the ball, go find it and keep hitting it until it’s in the hole. If you lose it, take a penalty and play another.” Let’s not over-complicate things. As far as Jim’s revisions are concerned, I’d be in favour of fewer clubs for competition but not opposed to bunters and choppers carrying more. They won’t help but that’s their problem. The divot rule is fascinating, and I have to admit I’ve vacillated on this more than once. It’s true that divots should be GUR and allow for relief but I’m enough of a traditionalist to believe in “rub of the green” too. The real problem for me is that there doesn’t seem to be an exact definition of a divot. Many players say their ball has come to rest in a divot. The same players talk about replacing their divots. So, which is it? The hole in the ground or the hunk of sod in your hand? i agree with the divot rule change but the club number well we periodically go out with just 5 clubs for a real challenge and if you haven”t noticed they still use caddies on the tour.